Your email signatures can include branding, contact information, social media links, and marketing or other relevant information. So, it plays really important for you to have email signature. This resources will help you to setup an email signature in Office 365. Email can be branded with full, central control over email signatures, email disclaimers, email font, email font size, colors, and stationery. If you are using mail Office 365, unfortunately, we can't use an email signature with image easily. In this case, we need to follow certain steps, to achieve this. 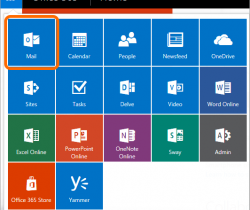 At very first step, log in to your Outlook on the web account (Office 365 email account) http://portal.office.com and go to the Mail app. Next, go to the settings, gear icon at the upper right-hand corner and click "Options"
On the left panel, extend the Mail section then Layout and select Email signature. Please check the option Automatically include my signature on new messages I compose so that email signature appears on every new email message. This is the important section, where a lot of people mess up. We need to have the image hosted online somewhere. If we just copy and paste the image into the signature block and send an email, then the receiver will receive an email with a big blank square with a red “X” in it. The best approach is to upload the signature image onto the web server and provide the URL on the email signature. Now, it's time for putting the uploaded image together with the email signature. For this, get the URL of the uploaded image. Open the browser and visit the URL of the uploaded image (tested on firefox). Copy the image and go to email signature section of your Office 365 online email and paste the image by using "Ctrl+V". After you put everything in the email signature window, click "Save".